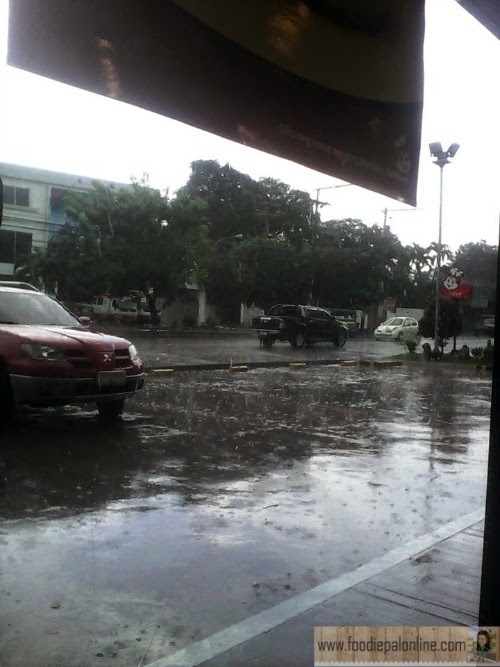 One rainy afternoon and our rain gear starts to wet, we run to the nearest establishment to draw out the chilled and ended up staying at Jollibee Buhangin because the rain was so extreme. 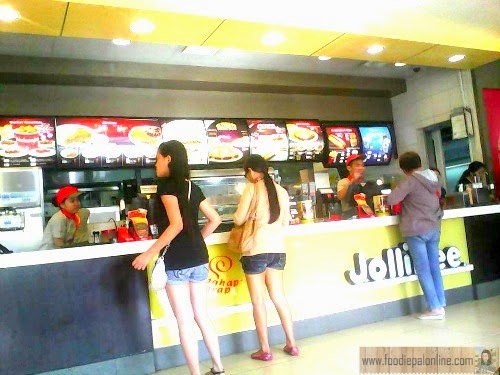 Upon entering Jollibee, I notice that they sustain a new concept regarding the design of their furniture's and fixtures. And besides the new furniture, there was an over-simplified menu behind the cash register. The place looked clean and spacious, they also have place for parties. 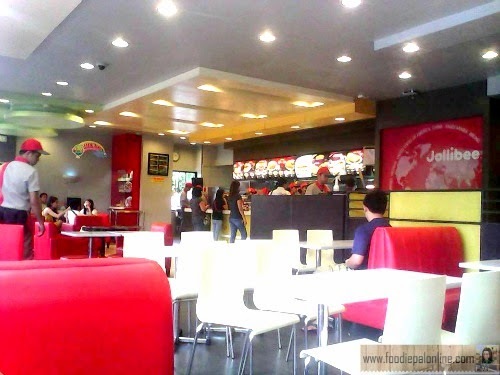 Actually, it's been a year that I haven't visited Jollibee and the place looks great now! Considered to be the largest fast food chain in the Philippines. Now operating worldwide with International branches at VIETNAM, BRUNEI, SINGAPORE, HONGKONG, QATAR, SAUDI ARABIA, KUWAIT and USA. Started as an ICE CREAM PARLOR which later grew into an emerging global brand, the JOLLIBEE. While waiting for the rain to recede, I order my daughter's favorite french fries. 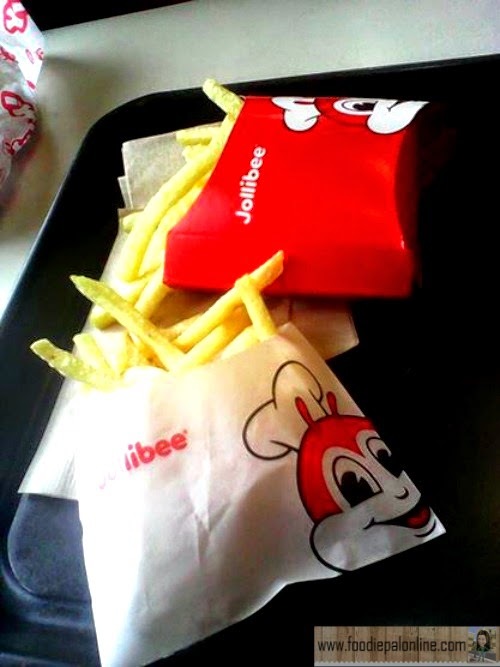 Honestly, I don't eat Jollibee very often, and I am not a Jollibee French Fries lover either. I don't like their fries compared to McDonalds French Fries that is so crispy and much more tasty. and putting gravy over your rice...hmmm drools'. For those who don't know, chickenjoy is like a normal fried chicken, but infused with joy! 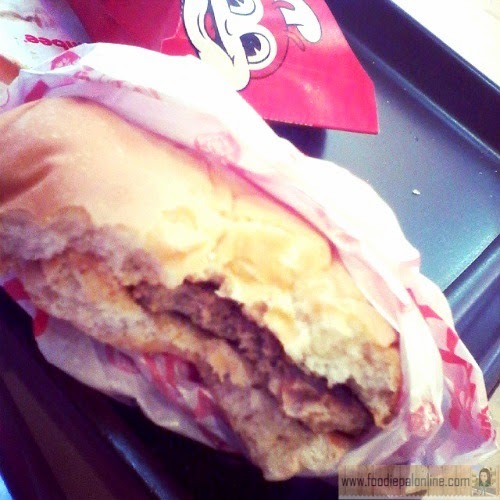 But we already have our lunch in the house, so I ordered JOLLIBEE Value Meal Burger Yum for our merienda(snack). YUM BURGER is great with mayo or ketchup, meat could honestly more better in quality, but still I like it because it taste like durian(but not with a stinky smell). The food was moderately priced and mediocre at best. Service is a bit slow. They were all about 5 people working that time, 2 which are in front of the counter, 1 is cleaning up, and 2 preparing the orders. I saw other staff staying at the side of the counter but are not doing aside from talking(I think they are off duty and about to leave but still stuck because of the rain). Another thing I discover here is that you cannot access their WiFi without asking for a password, I ask for the password the service crew returned back the paper blank and said they don't have the password because the assigned person is ON LEAVE. So sad to know that they don't have it, and they cannot ask for it. In conclusion, Filipino's are drown to Jollibee like a moth to a light. Just like I said, I don't eat at Jollibee to often. Yes, I am a Filipino and Jollibee is a Filipino Company but sometimes you just got to be truthful. Jollibee is a one stop for burgers, fried chicken, and spaghetti, etc.. quality of food is great but need to tell you that I am sadly unimpressed by the way the service they have at Jollibee Buhangin. Hope next time the assigned person for the WiFi Password if she/he is on leave she/he must leave a note to tell her/his subordinates about the Password. (In McDonald's internet is accessible anytime.) I cognize this is just a minor problem, merely if you require to market your company it should deliver a great SERVICE and that includes the internet connection.